Volleyball is a popular sport that is played professionally, as well as in recreational leagues, on school teams, in backyards, sandlots, or beaches. The game of volleyball can be enjoyed virtually anywhere a net can be set up, including over a swimming pool. A typical volleyball game uses six players on each side. The aim is to deliver the ball over the net and "ground" it (have it touch the ground) on the opposing side while preventing the ball from touching the ground on their side. Champion PAOK added another volleyball trophy to its collection on Saturday as it won the Greek Cup beating Iraklis in the final held on Crete. Ekathimerini. Sunday, 21 Apr 2019 19:48:56 GMT. Volleyball was developed by William G. Morgan, a physical fitness instructor at the YMCA in Holyoke, Massachusetts. His goal was to invent a game for all ages that was not as physically taxing as basketball. When a basketball itself proved to be too heavy for the sport, Morgan commissioned Spalding to make the first "volleyball" out of calf skin. Eventually, the game moved from recreation only into the professional competitive realm, and is now a featured sporting event in the Olympics. FIVB, the International Volleyball Federation, is the worldwide governing body for Volleyball and Beach Volleyball. USA Volleyball is the United States governing body for volleyball participation in the Olympics. The regulation volleyball court is a rectangle, 18 meters by 9 meters divided into two equal squares by the center line. Above the center line spans a taut horizontal net that is 2.43 meters above the court. The net is 9.5 meters long, and 1 meter deep. The mesh features squares that are 10 centimeters wide. 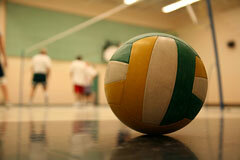 The volleyball is 65-67 centimeters in circumference and 250-260 grams in weight. The outside is leather, over a bladder of rubber or similar material. It must be of one color and cannot have any laces. Volleyball uniforms consist of a vest or jersey, shorts, kneepads, and rubber or leather shoes without heels. Team members wear the same color and may play in numbered track suits during cold weather. Play begins with the serve of the ball, and players take turns rotating around the court so each player gets a change to "serve" the ball. The ball may be "served" when the server bumps the ball into play across the net with a fist, or throws the ball into the air and strikes it with a hand or arm to bump it across the net into the opposing team. Members of the opposing team then attempt to "save" it from hitting the ground and loft it for a teammate to play. Each team is allowed to contact the ball three times before returning it over the net. No individual may hit or be touched by the ball twice in succession, and the ball must never be held, lifted, or carried. Play continues until one team allows the ball to touch the ground in its own court or fails to correctly return it. A point is rewarded to the serving team if the opposing team makes the fumble. If the serving team incurs the fumble, the receiving team is then allowed control of the ball and becomes the serving team. A ball may be "set" (hit in a high pass) so that a front-line player can "spike" it (smash it to the floor in the opponent's court). The opposing team may attempt to "block" the spike, using the hands and arms near the net in an attempt to stop the ball. A "tactical block" is when a player fakes a spike and then makes a soft pass over the block. A "volley pass" is the term for using the fingers of both hands above shoulder level to strike the ball, while a "dig pass" is the term for striking the ball with one or both arms below shoulder level. Points can only be scored by the serving team, and the first team to reach 15 points wins the set as long as they have a lead of two points. If the lead is less than two points, the play continues until a 2 point lead is established. A match is decided by the best of three or five sets, as determined prior to the game, although national and international league games must be played to the best of five sets.